Our first ever live reading! Below is the announcement for our first ever live reading celebrating our two years online and our readers! If you’re in the NY area, do come! Featuring past contributors: Anthony Cappo, Natalie Eilbert, Beth Morgan, and Marina Rubin. We’re happy to announce our first ever event for The Boiler. 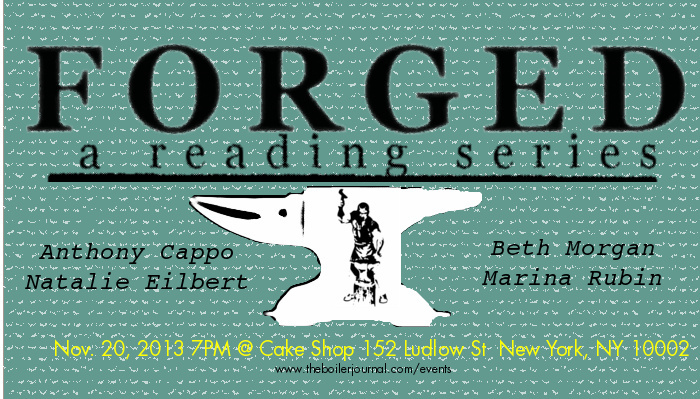 We hope to make this a sort of mobile reading series. We’re not sure how often we’ll do this or where it will be next, but we hope to see you there if you can make it! Plus, we’re celebrating two years of publishing online! We started way back in Dec. 2011 and have been growing strong ever since.